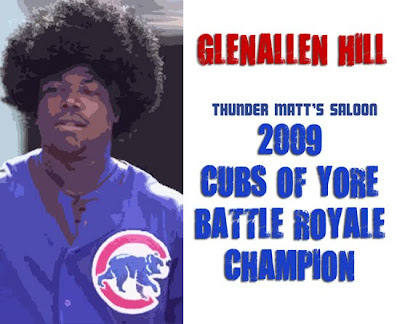 Thunder Matt's Saloon: Glenallen Hill: 2009 Battle Royale Champion! With a final score of 20-17, Glenallen Hill defeates Keith Moreland to become the first ever champion of the Cubs of Yore Battle Royale. Congrats to Hill, and good luck to him next year when he'll defend his title in CoYBR 2010. Thank you to everyone that participated throughout the Battle Royale.